I sliced a block of tofu into four slices. Cover and marinated the tofu in sambal olek. Seared the tofu on high heat with a little bit of olive oil. And placed in the cooler to cool down. I julienne some carrots and red bell pepper. 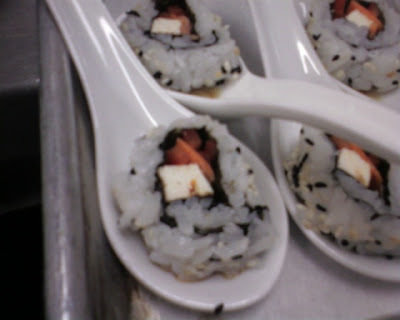 Removed the tofu from the cooler and sliced into long batonnets. I placed the sushi rice on the nori in a thin even layer. Flipped the sheet over and placed the tofu, carrot and red bell pepper. Rolled the sushi tightly. 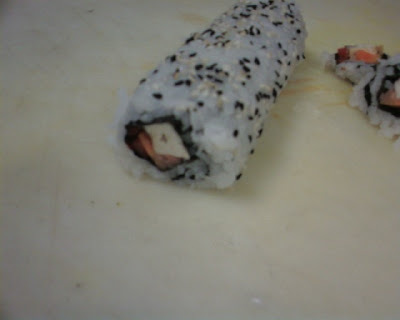 And rolled the sushi in toasted white and black sesame seeds. I allowed it to chill for 15 minutes to get firm... then i sliced into 12 pieces for the amuse. Placed the sweet sesame sauce (which w as teriyaki sauce mixed with sugar, fish sauce and sesame oil) on the bottom and sushi on top.